It's that time again were the leaves start to fall off the trees and the nights are long, dark and cold. As much as i've just painted a miserable picture, it does also mean that it's my favourite season for makeup. 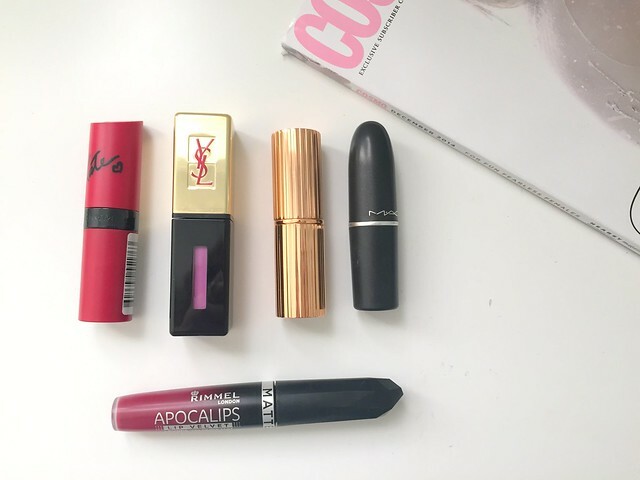 The biggest change in my makeup bag at this time of year is my lipstick/lipglosses so I have wriggled it down to my top 5 (there's one favourite that featured last year too). First up is the one you'll have heard the most about i'm sure. The colour is the perfect mix of berry and red, it's really up my street. It lasts forever on the lips, it's matte but isn't drying and it doesn't bleed like other bright lipsticks I own. I love this in the day, blotted into the lips for a more wearable look but it looks equally as nice wore fully applied from the bullet for a brighter, bolder look. The most expensive of the lot comes from YSL. I won't talk about this to much because i've reviewed it here. I love the application of this and the way it looks both after the first application and after the second, two minutes later. This lasts forever and is moisturising and glossy on the lips. It looks more like a lipgloss when it's first applied and then after a couple of hours it sinks in more to a lipstain. My newest addition and my first Charlotte Tilbury product. First of all, the packaging is just beautiful I mean talk about luxury. And the colour, this is what Winter dreams are made of. When I bought this, the mua applied it full on with a lip brush and the difference in the size and fullness of my lips was amazing. Even applying it straight out of the bullet achieves a fuller look so this is definitely worth the whole 23 English pounds I spent on it. A new drugstore launch I haven't heard about, I must be a busy bee. Anyway, on a recent trip to Boots I saw this on the shelves and added it to my basket. 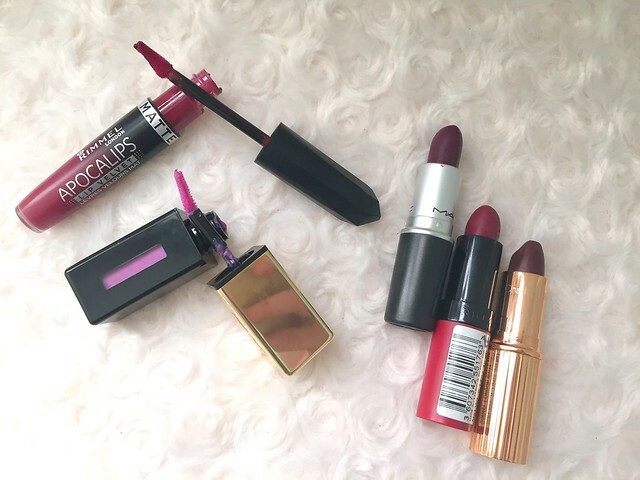 The colour is the perfect berry shade and it's pretty similar to the original Apocolips formulas except for its matte finish. The older range is pretty long lasting so you can imagine how long the matte range lasts for. This feels lovely on the lips which is weird for a matte lip and actually feels pretty moisturising, definitely keep an eye out for these. Another firm favourite of mine comes in the form of Mac Rebel. Similarly to Kate Moss 107, this looks beautiful both patted into the lips and worn boldly. This is more drying than 107 but it isn't anything too much, worn with a good lip balm applied before and you'll be fine. 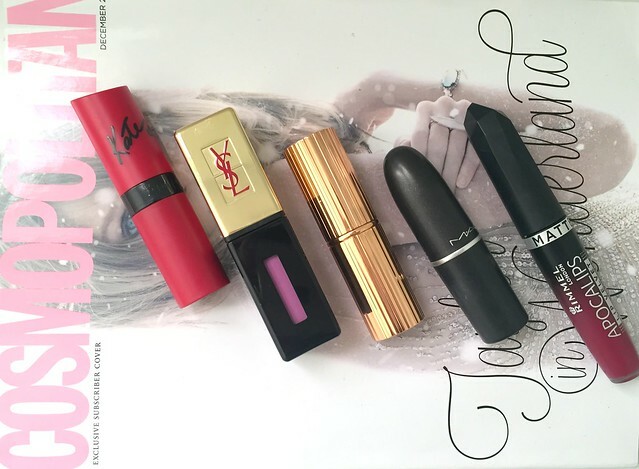 I love Kate Moss 107, probably my favourite lipstick. I use Mac Cyber but I think I prefer Rebel after this post! Great picks! Though these are all colors that I think look fab on others but not on me, lol :-) When it comes to lipstick I'm definitely more of a spring and summer type. Mac Rebel is gorgeous, i've sampled it so many times but always talk myself out of buying it.